This Heavy Duty Field Knife is a stout little assembly of leather and metal that will gladly take a beating, only to come back and ask for more! This knife is made for heavy use and features a size that lets it practically anywhere with ease. The knife possesses full-length construction, having been made from one piece of hand forged high carbon steel. The knife has a full-length tang that is heavy and thick, providing a great deal of strength, while the tang is also wrapped up in attractive, hand-stitched leather to provide for a secure and comfortable grip. Most of the blade is blackened steel, although the edge is polished and features a sharp factory edge, making it ready for use. The hammer pommel is flat and designed for impact, giving this little blade yet another use. The knife is diminutive and yet effective, having an overall length of only 10 inches, with a blade that measures 4.5 inches. 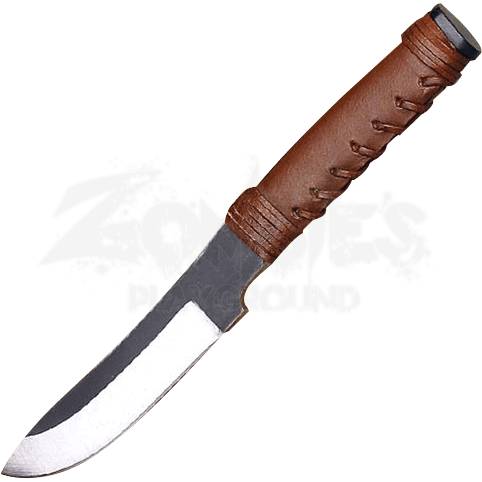 It includes a genuine leather belt sheath that is perfect for keeping the knife at your side, at all times. This Heavy Duty Field Knife is a fantastic little companion to keep on you at all times, possessing a variety of different functions and utilities that render this knife absolutely indispensable when it comes to camping, hiking, hunting, or even just everyday activities that might require a little bladed help.